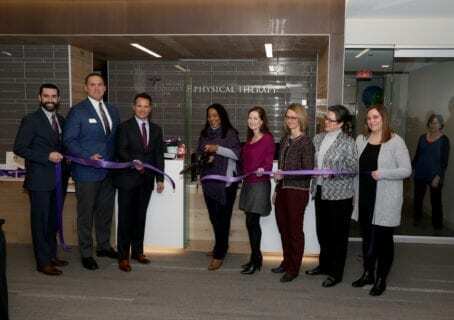 DMU President Angela Walker Franklin, Ph.D., cuts a ribbon to celebrate the renovation of the Physical Therapy Clinic. When it comes to describing DMU’s renovated and sun-filled Physical Therapy Clinic on eighth floor of the DMU Clinic, patients say it best. DMU’s physical therapists treat a wide range of conditions. The new space complements the diverse expertise of DMU’s physical therapists. Conditions they treat include athletic, work or accidental injuries; post-surgical issues that require rehabilitation; dizziness and vestibular problems; incontinence and bowel dysfunction; lymphedema; and chronic, back, muscle, joint, pelvic and pregnancy-related pain. The PT Clinic is an ideal facility for these services as well as the clinic’s classes, which include active adult exercise, core strength with Pilates, yoga for healthy aging and tai chi for arthritis and fall prevention. “One of our main goals was to provide a space utilizing as much natural light with an open-design concept that still allows for patient privacy and comfort,” Dr. Smith says. 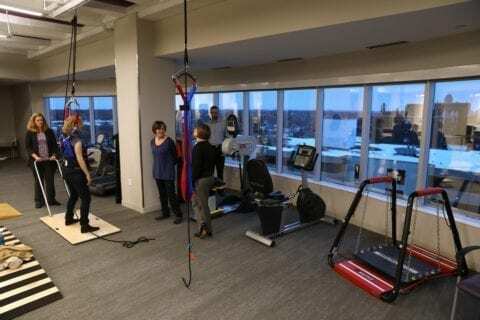 The clinic includes a gym with east-facing windows and advanced equipment to retrain balance and improve patients’ confidence in their mobility. Harness equipment installed in a track on the ceiling allows patients to push themselves physically without fear of falling. The harness can decrease a percentage of a patient’s weight, too, to assist in walking for those with pain or neurological conditions. The DMU Physical Therapy Clinic features special equipment used to enhance patient mobility. The PT Clinic also features six semi-private exam rooms, four private rooms and a Therapy, Education and Multipurpose (TEAM) room with conference tables and chairs that can be wheeled out of the way for the exercise classes. Phil Blumberg, M.H.A., executive director of the multispecialty DMU Clinic, says the enhanced space reflects the larger facility’s mission. “There are upgrades taking place throughout the DMU Clinic that are part of an overall initiative to enhance patient care. We’re doing this by addressing the current and future needs of our community and creating an environment conducive to our student’s learning by exposing them to the latest in health care design and delivery,” he says. 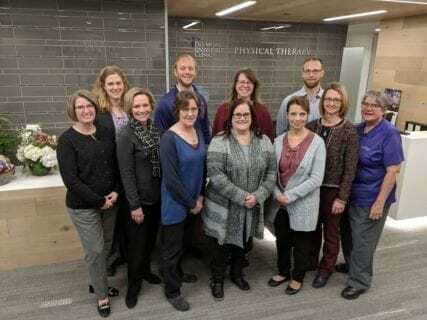 Learn more about the DMU Clinic and Physical Therapy Clinic via the links above, or call 515-271-1717 to make an appointment with a physical therapist. You can’t beat the views or the care!